Today’s insight comes courtesy of Ron Martin, devoted Reds fan and selfless collector. 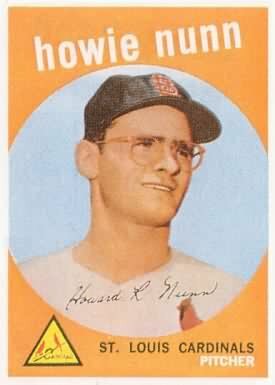 On the http://www.sportscollectors.net/ message board, a collector told of sending Howie Nunn a 1962 Topps card and $10 cash. Another collector’s letter was returned, autographed by Nunn, but no signed card was included. Ron posted an update that Mr. Nunn had entered the hospital, facing uncertain prospects. I contacted Ron, asking how he knew. Being a student of Reds history who appreciated Jim Brosnan’s book The Pennant Race, Ron has been trying to collect the autographs of the remaining 1961 pennant-winning Reds. Since Ron lived less than an hour from Mr. Nunn’s home, he wrote in hopes of an in-person meeting. He’s met many of the 1961 Reds. Being a studied collector, Ron knew that Nunn has been an iffy signer for years. Therefore, he offered to pay for an autograph, even inviting him to a meal out. Ron’s two-page letter brought a phone call from Mrs. Nunn. She explained her husband’s situation. Instead of moaning over the near-miss, Ron’s purchased a copy of Brosnan’s book for Mrs. Nunn. He noted that he’s mailing it to the author, in hopes that the personally-autographed book can be forwarded to her. I wish the hobby had some type of special achievement award such collectors could receive. Ron is helping other hobbyists with the news (namely, that Mr. Nunn’s grave health looks like he’ll never be signing autographs again, and that any letters would be a wasted burden on his family). Ron’s all-out effort got a phone call from Mrs. Nunn. Remember, he sent a two-page letter to Mr. Nunn. A brief, generic form letter would have been ignored, prolonging the mystery of the missing card. I’m most impressed that Ron has reached out to the Nunn family, despite his inability to get an autograph. If you ever get a chance to thank the spouse of a former player, do it! Thoughtful wives remind retirees not to forget their fans who collect. Let’s not forget these off-the-field stars. Without them, there might be lots fewer autographs. As a devoted Reds fan myself, I appreciate what Ron is doing. Hard to believe that 1961 team was 50 years ago! I followed up with Mrs. Nunn several months ago to see how she was doing. She was kind enough to share some very personal stories which I would never divulge which were quite interesting. She advised me that she had received the signed book from Mr. Brosnan on the day that Mr. Nunn passed away. She wanted to know if she could keep the book. Of course she can keep the book! Of course I need to thank Mr. Brosnan for signing his book and sending it to her!